The herd moved into the pens and then to the front of the farm to finish the last of the 2013 alfalfa. That’s right, when the alfalfa lady stops singing, it’s time to open presents and prepare for your 2014 resolution. No weight loss regimes on this farm. We’re hoping for weight gain 2014 for the boys and girls. They are looking great and happy and healthy. It’s been cold in the morning. Each day, Mr. Bus Driver will tell us another French cold joke. My favorite is the one where it is so cold the snail tentacles don’t peek out. Our girls are used to the cold, so this is nothing compared to where they are originally from. It’s practically Club Med for them. 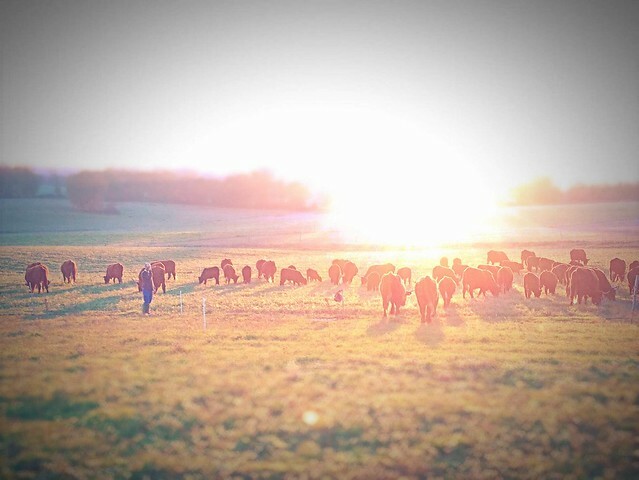 Mr. G snapped a shot of Brent with the cows in the sun. Brent is talking to me on the “talkie walkie” about how it all went. Beautiful photograph! It’s always hard to capture the beauty of farms in the winter – we’re covered in sludge from ice and rain and it’s all dreary. But this is beautiful, peaceful and blessed! Is this my debut in a tilt-shift photo? My first time in miniature! Actually, Brent, Gary and I set up a little miniature cow move when you weren’t looking. He then photographed it. Thankfully everything played out with the cow move and the scene stood strong when the real data came in. Yeah, came out okay for an iPhone shot. Big Lens is the post processing app if anyone wants a play. Brent, Is that one of your bonfires in the background? Beautiful photo! That’s Christmas card-able, frame-able art!